Today was a day to remember – we met Alan! We had cycled into Bradford-on-Avon to explore. A lovely market town nestled at the foot of a 14% hill, it has many historic buildings built with the attractive warm sandstone typical of the area. There is an ancient bridge in the centre of the town and the town itself is dotted with old spinners’ and weavers’ cottages, winding narrow streets and, along the river, fine buildings that were formerly woollen mills but have now been turned into apartments. On the cycle back, we pulled up at the Dog & Fox for a cold pint. That’s when we came across Alan – a tortoise, would you believe, in his run with other tortoises! One of the patrons brings her tortoises with her to the pub, as you do. This time she had five of them with her and proudly told us she had ten more back at home. They were red-footed tortoises, with quite unusual markings on their shells. We were introduced to the smallest, Alan – the others were much larger and must have been about 50 years old, but they didn’t want to speak to us. We swiftly downed our pints and continued on our way, not quite sure if the heat had had a strange effect on us! 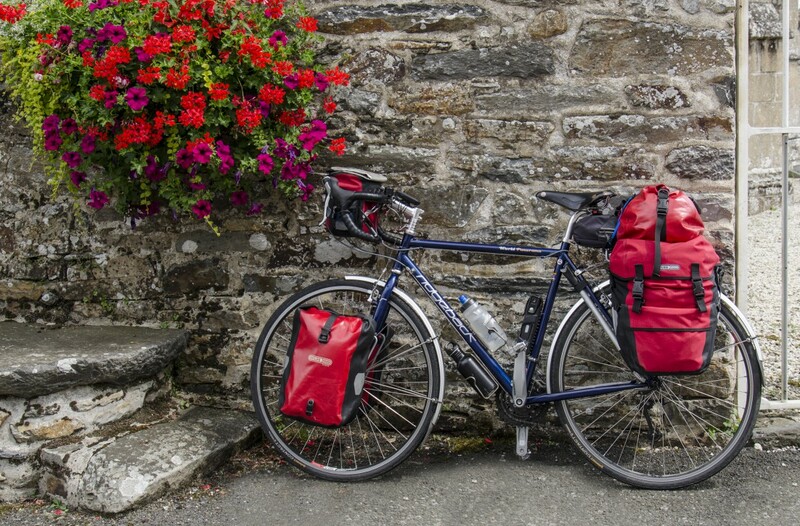 Categories: Bike packing, Cycle camping, Cycle touring, cycling, Mike McEnnerney, photographer, Photography, PhotoLink Images, Tourism, Travel | Permalink.